West Windsor, N.J. – It’s time to blast off for good time as Mercer County Community College’s (MCCC’s) Academic Theater and Dance program presents the campy jukebox musical “Return to the Forbidden Planet.” This cult classic comes to MCCC’s Kelsey Theatre Fridays, April 26 and May 3 at 8 p.m.; Saturdays, April 27 and May 4 at 8 p.m.; and Sundays, April 28 and May 5 at 2 p.m.
Kelsey Theatre is located on MCCC’s West Windsor Campus, 1200 Old Trenton Road. The community is invited to an opening night reception with the cast and crew on April 26. A spaceship with Captain Tempest at the helm makes an emergency landing on the uncharted planet of D’Illyria. The only residents are the mad scientist Dr. Prospero, his daughter, Miranda, and their retro robot, Ariel. They were banished into hyperspace when Miranda was just a baby, and she has known no other world than this one. This tale of unrequited love, a scary space monster, dialogue in iambic pentameter, and lots of fun songs all adds up to one groovy show! Loosely based on Shakespeare’s The Tempest and the 1956 sci-fi movie “Forbidden Planet,” the show parodies old sci fi flicks, while paying homage to Shakespeare and much-loved rock ’n roll classics such as “Great Balls of Fire,” “The Monster Mash” and “Good Vibrations,” among others. The cast stars Jeff Rosenthal of Dayton as Captain Tempest; Darrell J. Watts of Ewing as Dr. Prospero; Kate Bilenko of Philadelphia, Pa., as Miranda; Sonia Perez of Princeton as Science Officer Gloria; Kristin Purdy of Clarksburg as Ariel; Diego Montealegre of Lawrenceville as Cookie; Natalie Bogach of East Windsor as Navigation Officer; and Tyler Fowler of Millstone as Bosun. 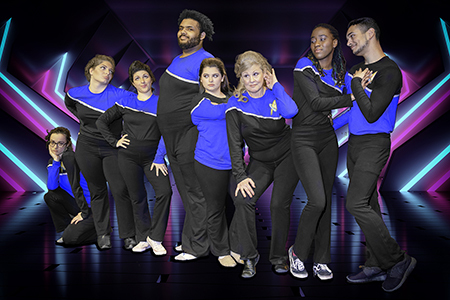 Members of the shuttle crew are Eva Hargis of Hamilton (Chief Protocol Officer), Krystan Ellis of Hamilton, Samir Kirkland of Ewing, Tina Kulick of East Windsor, Ereaunna La Cava of Ewing (dance captain), Sam Marquez of Ewing, Anna Perno of Hamilton, and Cerina Pocino of Hamilton. The production team is composed of faculty, students, alumni and members of Kelsey Theatre companies, including Co-producer M. Kitty Getlik, who is also the make-up designer, Director LouJ Stalsworth, Vocal Director Josh Wilson, Music Director Scott Hornick, Set Designer John M. Maurer, Lighting Designer Chris Ghaffoor, Sound Designer Evan Paine, Costume Designer Kate Pinner, Video Director Chris Soto, Stage Manager Melissa Gaynor, Assistant Stage Manager Andrew Devlin, Properties Managers Haley Schmalbach and Jenna Moschella, Assistant Choreographer Emma Bryce, and Production Assistant Timothy Prill. Set construction is by John M. Maurer, Jim Petro, Kate Pinner, and MCCC’s Stagecraft 102 class. Charge Artist is Haley Schmalbach and costume construction is by Francisco Estrada and Shelley Weiss Lightman. Vicki Kaiser is the lighting technician and Jon Cintron is the sound technician. The stage crew includes Andrew Devlin and Fabiola Bien-Aime’. Follow spot operators are Zoey Montplaisir and Timothy Prill. Hair and makeup are by Eva Hargis and the program is by Amy Bessellieu. Music Program Coordinator Scott Hornick will conduct the orchestra. Featured musicians include Josh Wilson on piano/thermin, Melanie Perez on keyboard/ synthesizer (horn parts), Jillian Ashcraft and Carolina Perez on guitar, Joe Suarez on drums, and Nate Perrucci on bass. Tickets are $20 for adults, $18 for seniors, and $16 for students/children and may be purchased online or by calling the Kelsey Box Office at 609-570-3333. Kelsey Theatre is wheelchair accessible, with free parking next to the theater. For a complete listing of adult and children's events, visit the Kelsey website or call the box office for a brochure. 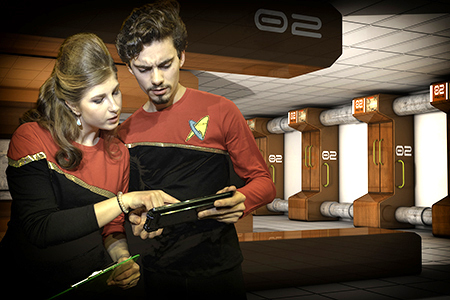 Charting their course are Natalie Bogach as the Navigation Officer and Tyler Fowler as Bosun. Photo by Robert Terrano. Crew members Tina Kulick, Cerina Pocino, Anna Perno, Samir Kirkland, Ereaunna La Cava, Eva Hargis, Krystan Ellis, and Sam Marquez are ready to head into outer space. 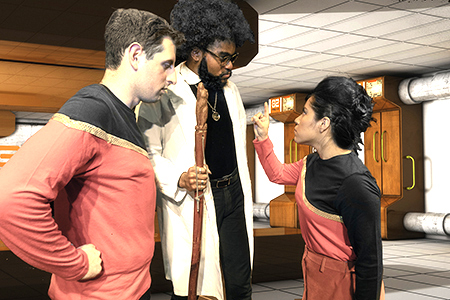 It's mission critical for Jeff Rosenthal as Captain Tempest, Darrell J. Watts as Dr. Prospero, and Sonia Perez as Science Officer Gloria.